Ominous clouds surrounded Oakshade Raceway on Saturday night, but did not put a damper on some early heat race action for the $2,000 to win American Late Model Series (ALMS) presented by Sunoco racing program. After the ALMS, Sportsman and a few Bomber heat events had concluded, a light rain began falling as the first of two ALMS consolation events rolled onto track. Cars continued to circulate around the track until the rain finally ceased. More drivers were called to the track to help run it back in. After a short time, racing was ready to resume. Just as the cars were starting to line back up for the start of the race, the skies opened up and a downpour forced race officials to cancel the rest of the evening’s action. The ALMS consolations and feature will be made up on the September 3rd ALMS event. The remaining Bomber heat races, Compact heats and Sportsman feature event will be run at the start of next week’s (8/6) program with the remaining features to made up in the following weeks. 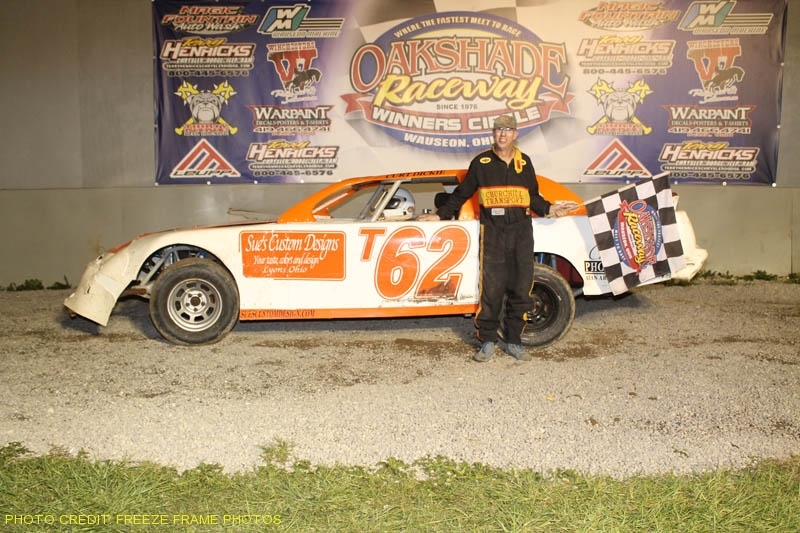 For updates, follow Oakshade Raceway on Twitter @OakshadeRaceway or visit oakshaderaceway.com.